U.S. Army Pacific held a Family-Soldier Fun Run/Walk on June 12 at Historic Palm Circle, Fort Shafter, Hawaii, to celebrate the Army’s 242nd birthday. The two-mile run consisted of Army units and Family members stationed on Oahu. Army installations around the world are celebrating the Army’s 242nd birthday today, June 14. The types of celebrations are as varied and unique as each of the bases where they take place, but they all celebrate the enduring value of the Army and the service of its Soldiers in its 242 years of existence. A common Army birthday observance at many installations is a cake cutting ceremony, allowing Soldiers to take a few moments from their duties to enjoy the company of their compatriots and reflect together on the Army’s distinguished history. In fact, many of these ceremonies feature a unique Army tradition. It is customary for the Soldier on base with the most amount of time in the service to share the cake cutting duty with the Soldier who has spent the least amount of time in the service. For the 335th Signal Command stationed in East Point, Ga., U.S. Army Reserve Lt. Col. James Freitag and Pfc. Maurice Montgomery performed the cake cutting for their unit’s Army birthday festivities this year. 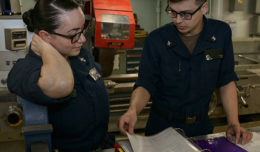 Freitag, at 59 years of age, has a distinguished 36-year service record, while Montgomery, a 22-year-old medic, just joined the service two months ago. 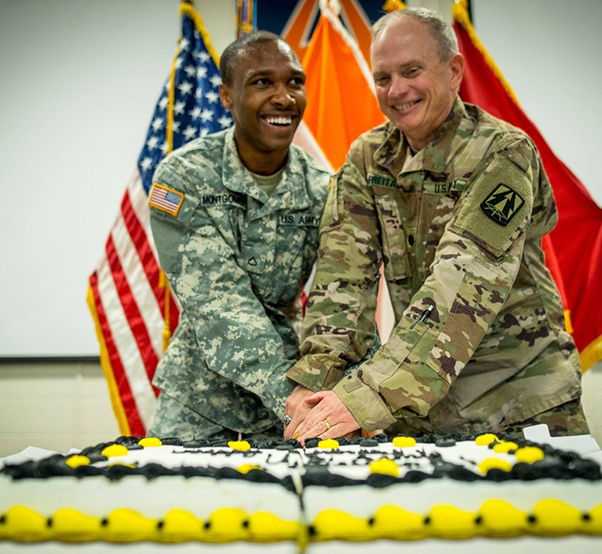 Both men smiled proudly as they posed for photos, ready to serve up a special birthday cake frosted in Army colors. 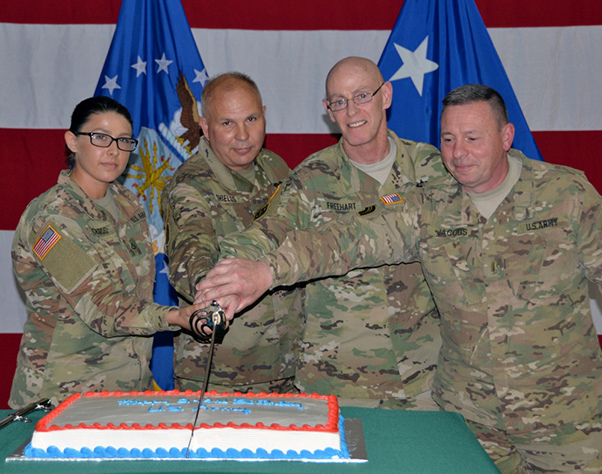 The New York National Guard also participated in a cake cutting ceremony at the New York National Guard Headquarters in Latham, N.Y. For these Guard Soldiers, the Army’s birthday was an opportunity to not only celebrate the Army’s heritage, but embrace new beginnings as well. The Soldiers uncased the new colors of the Army National Guard’s Joint Force Headquarters detachment during the birthday festivities. Youngest and oldest Soldiers present cut the birthday cake during Army Birthday ceremonies at New York National Guard Headquarters in Latham, N.Y. on June 17, 2017. Cutting the cake are, from left, PFC Jade Richards, the youngest Soldier, Brig. 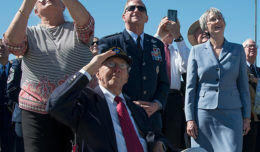 Gen. Raymond Shields, commander of the New York Army National Guard, Col. James Freehart, the oldest Soldier present, and Chief Warrant Officer 5 Gordon Jacobs, another Army veteran. 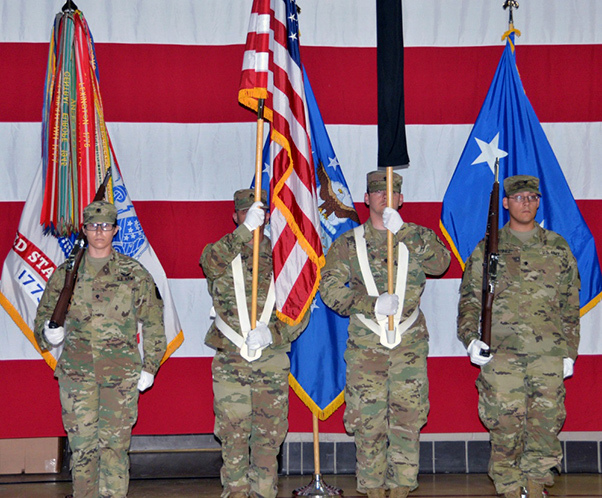 New York Army National Guard members celebrated the 242nd Birthday of the United States Army. Over at Fort Shafter, Hawaii, U.S. Army Pacific Soldiers counterbalanced their cake consumption with a Family-Soldier Fun Run/Walk. 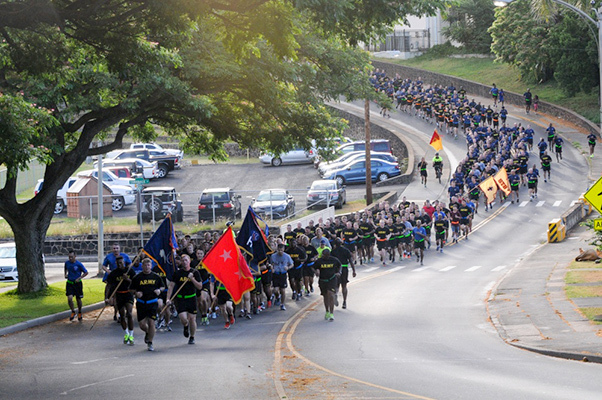 Soldiers, their families, and supportive civilians all participated in the two-mile run that took place on June 12. Following the run, the fort hosted a wellness fair that promoted activities and programs to ensure that Army Soldiers remain physically, emotionally, and mentally fit as the world’s best fighting force for the next 242 years as well. In addition to physical fitness and exercise, the fair emphasized the importance of sleep and balanced nutrition in contributing to overall wellness. 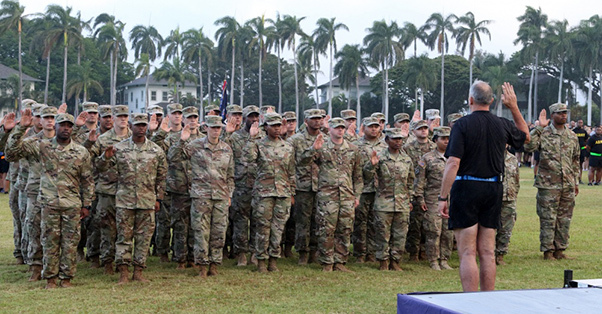 Prior to the run and the fair, U.S. Army Pacific also held ceremony where dozens of Soldiers commemorated the Army’s 242-year existence by re-enlisting. Approximately 33 Soldiers from across Oahu, who already had a combined 253 years of service, re-enlisted during the ceremony to commit to another 144 years of service collectively. Thousands of miles away in Englishtown, N.J., the U.S. Army Reserve’s 99th Regional Support Command joined with the local community to celebrate the Army birthday during the National Hot Rod Association Summer Nationals at the Old Bridge Township Raceway. 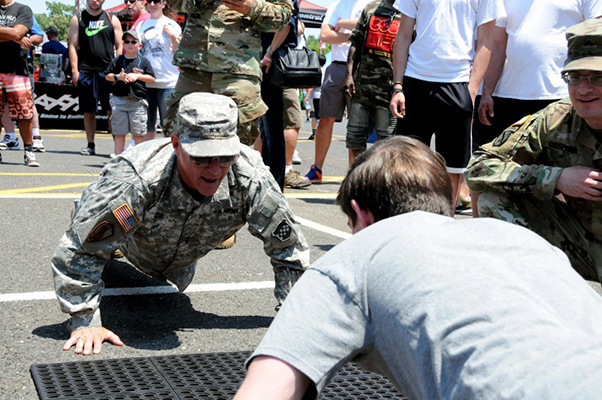 The event, called “Army Day at the Races,” invited civilians to partake in a variety of physical fitness challenges alongside Soldiers, including pull-ups and push-ups. For their hard exercise, the Soldiers also participated in a birthday cake-cutting ceremony at the track. New York Army National Guard Soldiers prepare to uncase the new colors of the Army National Guard’s Joint Force Headquarters detachment during Army Birthday celebrations at New York National Guard Headquarters in Latham, N.Y. on June. 14, 2017.New York Army National Guard members celebrated the 242nd Birthday of the United States Army. 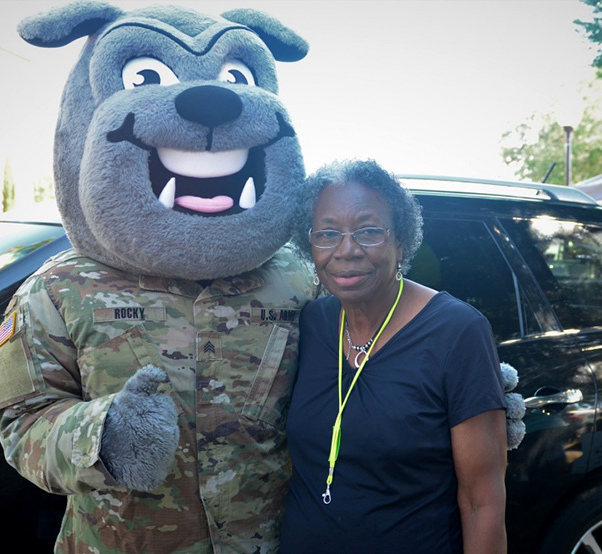 The civilian participation in birthday festivities continued in Hinesville, Ga., as the local community gathered with the 3rd Infantry Division to celebrate the Army birthday at the local farmer’s market. A few Soldiers with the 3rd Infantry Division formed a band and played songs to serenade the market goers, while local community members signed a large Army birthday card with personalized notes of thanks and good wishes. 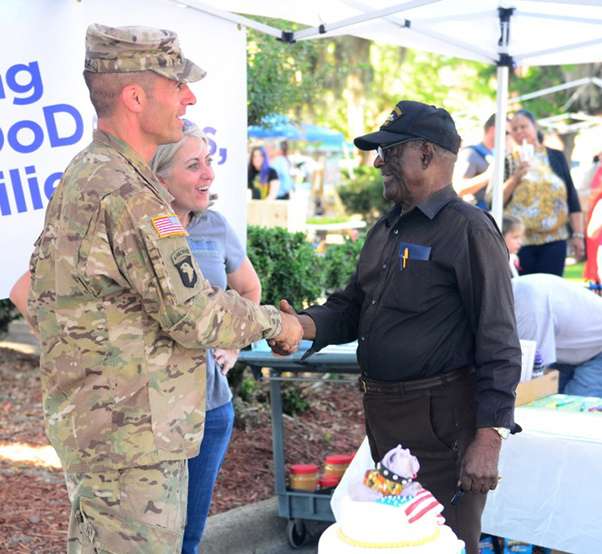 Col. Townley Hedrick, the garrison commander of Fort Stewart, Ga., cut the Army birthday cake with a local veteran service member as a gesture of the good relationship that Fort Stewart shares with the citizens of Hinesville. Even Rocky, the official mascot of the 3rd Infantry Division, made an appearance to pose for photos and help celebrate. As each of these commemorations show, Army Soldiers, their families, and their communities are proud to celebrate the Army’s birthday and its history as the nation’s premier fighting force for 242 years and counting. U.S. Army Pacific held a re-enlistment ceremony on June 12, prior to a Family-Soldier Run/Walk, as part of a series of events during Pacific Theater Army Week and Army Birthday Week, at Palm Circle, Fort Shafter, Hawaii. During the ceremony 33 Soldiers from across Oahu re-enlisted. U.S. Army Reserve Lt. Col. James Freitag, command support chaplain for the 335th Signal Command (Theater), and Pfc. Maurice Montgomery, a medic, cut a cake to celebrate the Army’s 242nd birthday, which will take place on June 14. It is tradition for the Soldiers with the most and least amount of time in service to cut the cake together. Freitag is 59 and has been serving our country for 36 years, Montgomery is 22 and has been in for two months. Maj. Gen. Troy D. Kok, commanding general of the U.S. Army Reserve’s 99th Regional Support Command, headquartered at Joint Base McGuire-Dix-Lakehusrt, N.J., completes push-ups with a teenage boy June 10 at the GoArmy experience during “Army Day At The Races” at Old Bridge Township Raceway Park in Englishtown, N.J. Kok was at the event to help celebrate the Army’s 242nd birthday during the National Hot Rod Association’s Summer Nationals. Maj. Gen. 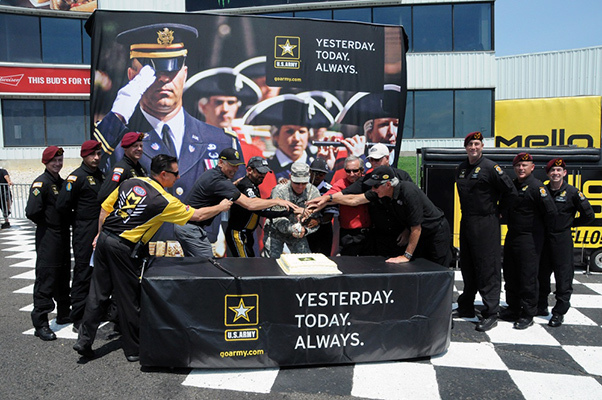 Troy D. Kok, commanding general of the U.S. Army Reserve’s 99th Regional Support Command, headquartered at Joint Base McGuire-Dix-Lakehusrt, N.J., helps cut the cake on June 10 with the help of Don Schumacher Racing crew. The cake cutting was part of “Army Day At The Races” at Old Bridge Township Raceway Park in Englishtown, N.J. Tony Schumacher (immediate left of Kok) drives the U.S. Army top fuel dragster. Members of the Army’s Golden Knights Parachute Team are also pictured. 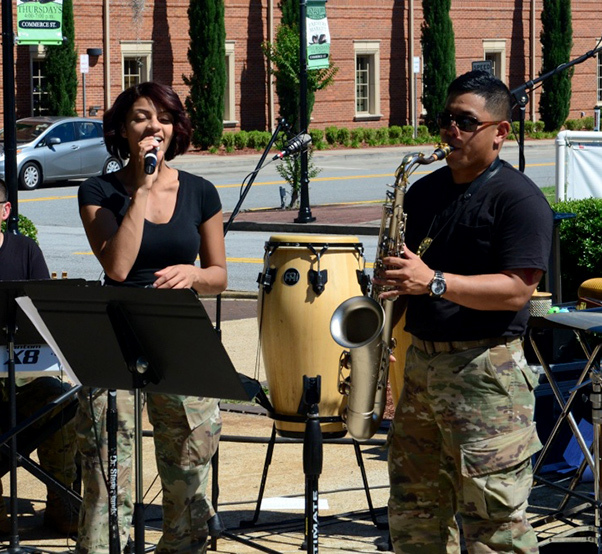 Soldiers from the 3rd Infantry Division Band play songs at the Hinesville Farmer’s Market June 8, 2017, as the local citizen recognizes the Army’s Birthday with a cake cutting ceremony. 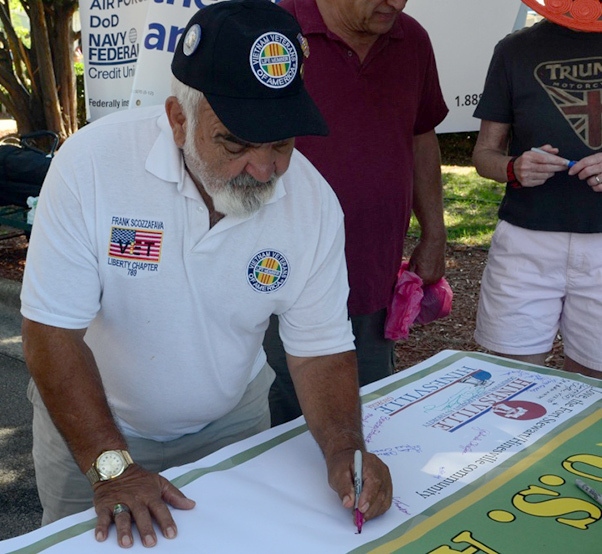 A local veteran signs the Army’s Birthday card at the Farmers Market June 8, 2017 in Hinesville, Ga., to honor the Army and its 242 years of service to the country. Col. Townley Hedrick, Garrison Commander of Fort Stewart, shakes hand of veteran who will also cut the cake with him June 8, 2017 at the Farmers Market as symbolic gesture of the relationship Fort Stewart has with the citizens of Hinesville, Ga.
Rocky, the pride of the 3rd Infantry Division, poses with a local citizen at the Farmers Market in Hinesville, Ga., June 8, 2017 as the local citizens recognize the Army’s Birthday and its 242 years of service to the country.